Factual error: During the Marshall-Xavier game the announcer refers to Xavier as the "Pirates", but Xavier's nickname is and was "Musketeers". Continuity mistake: Anne's hand is shaking pretty hard when she reaches out to give Paul the engagement ring back (the shot is from Paul's point of view). The camera cuts to a view from behind Anne and her hand is suddenly very still for the duration of that shot. The shot changes back 10 seconds later to be from Paul's view and Anne's hand is shaking again. Continuity mistake: In the game against Xavier, on the final play in which Reggie Oliver throws the dramatic, game-winning TD pass, the defensive lineman hits him just as he releases the ball. In the shot when he releases it, the pass is wobbling badly out of his hand, in fact, it appears to be end-over-end. When it's flying through the air, it's a perfect spiral. Continuity mistake: The chalk marks on the football disappear between shots when the coaches are discussing how they need to simplify the offense. The coach wipes the chalk board off with his hands, the grabs the football. The chalk marks are there for a while, but then he throws the ball to the assistant coach and the chalk marks are suddenly gone. Factual error: The movie takes place in 1970. When the funeral auto processions meet, there is a train crossing over the road in the background. One freight car is Conrail, which was formed in 1976, and another is CSX, formed in 1986. Factual error: When Ruffin and his teammate come out of the movie theater upon hearing the news of the crash, the fire trucks are heading east on the street. The airport was west of Huntington. Factual error: When the president is calling all of the coaches, there is a list of coach names and phone numbers. Until recently, three digit area codes always used a 1 or 0 in the middle. (ie. 305) On the list, which is supposed to be from the 1970s, the area codes are in the new format not using 1's or 0's in middle (i.e. 336). Area code 910 is also on the list, but it didn't exist then as a voice line, only for telex communications. 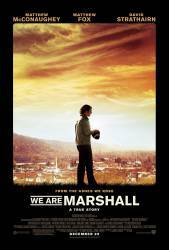 Factual error: In one of the game scenes a fumble is recovered and advanced by Marshall's competition. It wasn't until 1990 that the NCAA allowed a defense to advance a fumble recovery, until then it was a dead ball at point of recovery. Continuity mistake: In the scene where Jack is making call after call to the other coaches he is seen wearing just a shirt. During one call you can see the sleeve of a jacket, however, in the next full shot of Jack it is gone. Character mistake: When McConaughey and Fox are at West Virginia University to ask their coaches for help with their offense, McConaughey is shown talking while looking at his reflection in a football trophy. At first his reflection shows him talking out of the left side of his mouth, but then he quickly switches to talking out of the right side of his mouth as he does throughout the entire rest of the movie. Continuity mistake: On the chalkboard listing all the recruits, Jake Gibbs is the first name on the list of quarterbacks, with (PA) after his name. (PA) is in line with the name in the first scene. When they cross his name out in a later scene, it is angled up and raised, like a superscript. The third time we see the board, after the NCAA approves the exception, (PA) is back in line with the name. Character mistake: In the references to Xavier, the coach character and the announcer pronounce it "Ex-Zavier." It's pronounced "Zavier." Make this mistake at their games, and you would be booed out of the stadium. Factual error: The football field is the modern turf grass that is well manicured with the light and dark grass. In the early 70's the grass would have been one color and torn up more. Continuity mistake: In the scene where Coach Dawson strides off the practice field after knocking Nate Ruffin down, Coach Leyngel helps Ruffin up. In the very next shot, he is helping him up again. Jack Lengyel: One day, not today, not tomorrow, not this season, probably not next season either but one day, you and I are gonna wake up and suddenly we're gonna be like every other team in every other sport where winning is everything and nothing else matters. And when that day comes, well that's, that's when we'll honor them. Red Dawson has a cameo as the head coach of Morehead State.